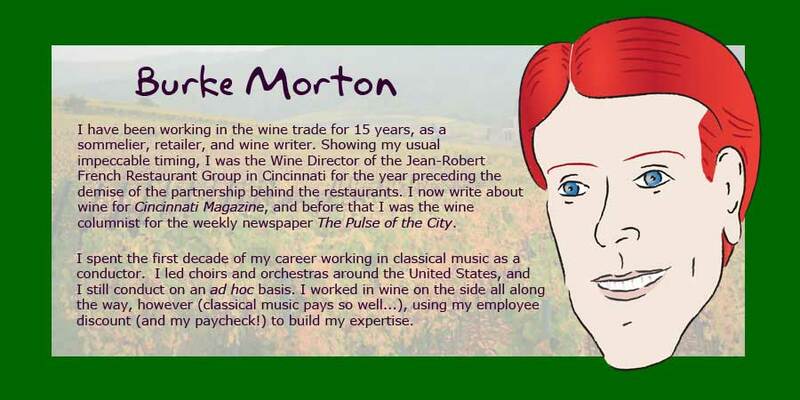 Wine writer Burke Morton, jack of all trades, master of two (according to him), narrowly avoided a date with the undertaker after opening a bottle of wine. He stabbed himself with the worm of his corkscrew while trying to remove a stubborn cork from a bottle of '97 Marcel Deiss Engelgarten Riesling. His sixth and final bottle of Engelgarten almost turned out to be his last bottle ever. "The damn cork on that wine...I've never gotten one out without it breaking. Spongy and brittle from the very beginning--worse than the cork on an old bottle of Chateau Musar!" Morton said from his hospital bed, clearly expecting me to know what he is talking about. "It made me so mad that I stabbed myself when I tried to slam the corkscrew back in to get the rest of the cork, but I missed the bottle and got my left index finger. That's what I get for being so hot-headed." When Morton struck his finger, the corkscrew didn't go all the way through the skin, but only got the top layers. Apparently that was the problem. "A staph infection got in between the layers of skin, and...well, my wave is now one finger shy of a hand." Morton, a classically trained musician, was remarkably sanguine about losing a finger, but the percocet may have been helping to dull more than just the pain: "Well, I wasn't a very good pianist anyway, though I sure will miss shredding like Hendrix." Even so, he manages to look at the bright side, "I like to learn, and now I'll have to relearn the home row." Speaking with Morton's doctor, it becomes clear just how confused Morton has become. "A staph infection? Could be, but what makes him think that, I wonder? Does he think he lost his finger because of Impetigo? I haven't seen an adult with that in ages. He had a Felon infection, which I can tell you is quite painful, but we don't know what caused it. It could have been Staphylococcus aureus, but since we cut the thing off, we didn't bother to culture it--couldn't afford to because of cut backs from his insurance company." Aside from the snarky doctor's breach of HIPAA laws, perhaps that's the bigger story here.